Massai (Burt Lancaster) is a proud Apache chief who refuses to bend to the white man's ways. When an ageing Geronimo, chief of the Chiricahua Apaches, finally submits to the encroaching horde, Massai accuses him of betrayal and fights a lone guerrilla war, killing many whites, robbing, looting and burning. Massai becomes a prize scalp and civilian tracker Al Sieber (John McIntire) is the man leading the pack to hunt him down. In the meantime, Massai falls in love with Nalinle (Jean Peters) who is convinced Apaches can live in peace with the whites if they farm the land, but the father of her unborn child wants to fight on and resigns himself to a death with honour. Along with Broken Arrow (1950), the story of Cochise, Apache (1954) was the beginning of a new approach to the representation of Native Americans on screen. 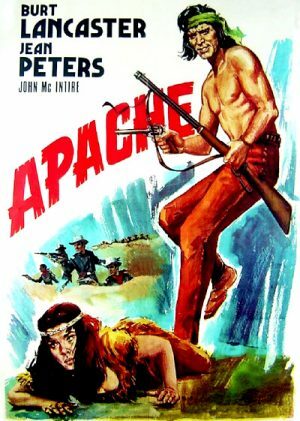 The sympathetic view of the plight of the oppressed Apache nation and the portrayal of the main character, the warrior Massai, as a complex individual rather than a bloodthirsty savage, was the main factor in attracting Burt Lancaster, a lifelong liberal and social activist, to the project.